This article refers to the process of converting an IBM Lotus file to a PDF document by using a PDF printer driver such as the novaPDF one. For the conversion to be completed, download the novaPDF application from the Download page and install it on your computer. The IBM Lotus Notes suite is a client-server application built to meet the needs of business development and interactivity. It has been around for more than 20 years into development and has been enhanced with each release for better management and new features. The client side of the project is called Notes and the server side Domino. The suite comes as a complete business solution for companies and professionals, replacing everything starting from the e-mail service to Office applications like spreadsheets, word files and presentations. This eliminates the need of using multiple applications for different purposes and gives the user the possibility to have everything under the same centralized interface. The client side of the bundle called Notes contains several components including mail, calendar, a development environment, a database management framework, etc. The Office component is based on OpenOffice.org and it is called Lotus Symphony. All the applications included are based on the OpenDocument format. Also the latest version have improved cross platform support as they can be deployed on Windows, Mac, Linux distros like Ubuntu and more. With all this however, the application is proprietary and has been criticized because of its unintuitive interface for the users as it had a number of buttons and names changed, making the person that used it confused when pressing or clicking on the respective options as they were doing a totally different thing. For increased portability and user interaction however the files created and edited with the Lotus Notes can be converted to PDF documents and managed easier without the need of having the whole suite installed as well. PDF converters like novaPDF contain additional features that have the possibility of enhancing the PDF even further with signatures, protection, bookmarks, watermarks, searchable content, file merging etc. Regardless of the Lotus application you are in, as long as that program support file printing within its interface, make the following actions to convert the lotus file to a PDF document. 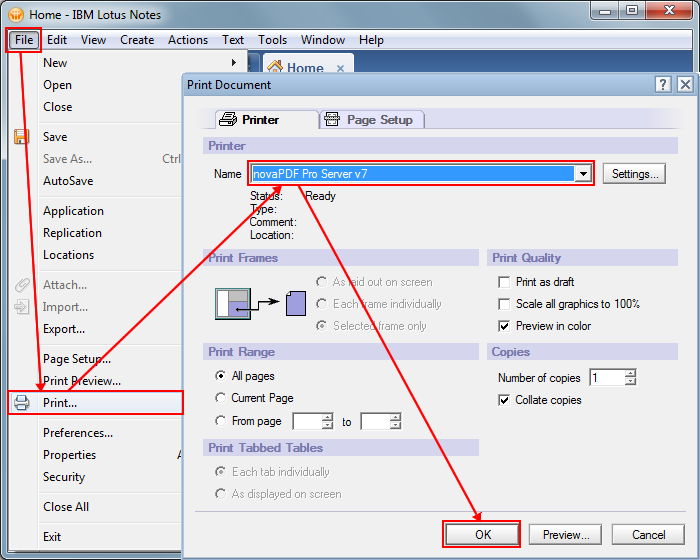 First open the file by clicking Open in the Lotus Notes interface. After you have opened the file a set of additional options will be visible. Now click on File->Print or press Ctrl+P and in the Print window select novaPDF as the printer name. Click OK, in the Save PDF File As dialog select any other options you want to apply in the PDF file and click OK one more time. The Lotus file will be then converted to PDF.